In the final quarter of 2012, Falcon Energy (L) Inc. requested De Raj Group to refurbish and reactivate a cold stacked Bethlehem Steel Corp., JU-200 MC Type, 3 columns, mat supported drilling rig, tagged BOSS 6 for future projects. The rig was brought into Singapore to undergo refurbishment and reactivation works. BOSS 6 was also to have capabilities of extended well testing so an Extended Well Test (EWT) skid was specifically built for the drilling rig. 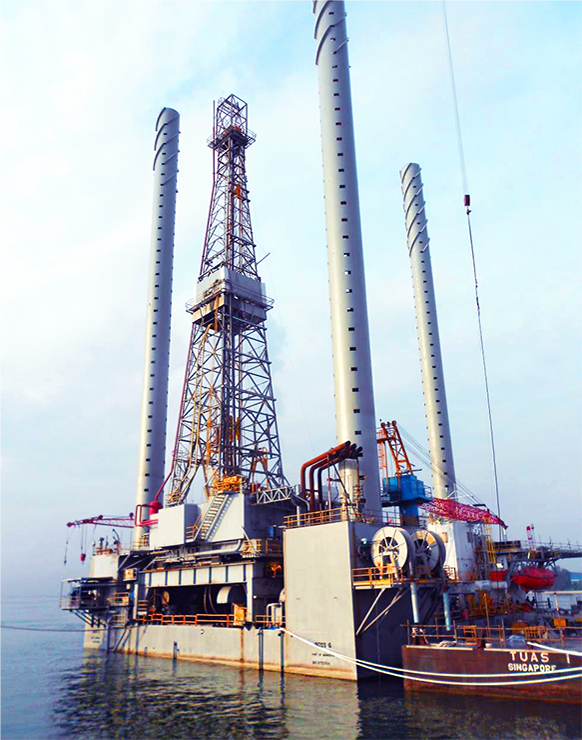 The rig was successfully reactivated and refurbished, ready for operations by the first month of 2013. The total refurbishment took approximately 5 months. Complete servicing of mud pumps, deep well pumps, etc. Complete refurbishment of marine systems, power generators, cranes, water makers, etc.